New horizons have opened up for commercial airline pilot Lean Janse van Rensburg. Where once the outlook was cloudy and visibility limited, his studies at The Da Vinci Institute have given him fresh perspective on life, work and his place in the world. 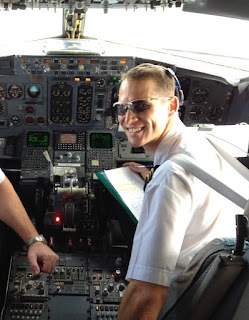 In March 2014, Janse van Rensburg signed up for a BCom degree in Aviation Management. All went well – so well that his average at the end of his first year was 85%. Things started looking even better in 2015 when he joined Safair as a pilot and was earning a salary again. During his research, for example, Janse van Rensburg discovered that flying from Johannesburg to Cape Town with Safair was only R1 more expensive than going by train, and R35 cheaper than going by bus. He brought this to the attention of management, who liked his suggestion that the company start targeting its marketing at travellers who normally travel by train or long-distance bus. This entry was posted in BCom. Aviation, management of systems, managerial leadership on October 19, 2016 by Da Vinci.